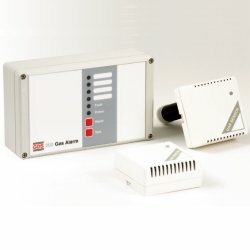 The GDS 202 gas leak detection system features a control unit monitoring up to 10 sensors on a single 4 core cable network, combining high specification with significant cost saving over conventional gas alarm systems. The control unit is of an advanced design using the latest technology and provides a high integrity system whilst enabling a significant cost saving over conventional gas alarm systems. Sensor types may be mixed and up to 10 in number for the standard control unit, or up to 20 when used with an optional auxiliary power pack. Alternatively sensors may be used separately without a control unit providing they are powered by a 12 or 24volt DC supply. 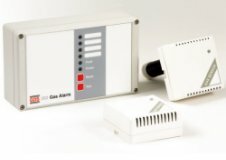 The GDS 202 has been designed with features that will provide an effective response to the detection and control of gas hazards in a wide range of industrial enviroments from boiler plant rooms, swimming pools, water treatment works, HVAC control systems, manufacturing and process plants.